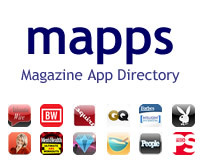 Last week, the Magazine Publishers of America (MPA) launched Mapps, the Magazine App Directory. It is a comprehensive list of mobile apps produced by magazines and media companies. Mapps includes descriptions and download links for 120 apps on a variety of platforms, including iPhone, iPod Touch, Blackberry, and Android with apps for the iPad platform, and other e-reader devices coming soon. Both free and paid apps are included on the list (they are listed according to company, magazine, and app name). Most of the apps on the list are free. They include one from Epicurious.com, called Epicurious Recipes & Shopping List, that allows the user to search over 27,000 recipes from Bon Appétit and Gourmet. Style.com has a collection of fashion runway videos to view, and Wired.com offers daily product reviews. Among the paid apps are $2.99 digital versions of GQ and Esquire that mimic the print publications. Cosmopolitan has a “to-go” version of the Kama Sutra, featuring a collection of sexual positions for $1.99. A large segment of the paid apps are for $1.99 and offer the reader gossip dedicated to their favorite celebrities such as Angelina Jolie, Brad Pitt, or Christina Aguilera. Sports fans can also receive dedicated news about their favorite teams, such as the Cleveland Indians and the Chicago White Sox. The most expensive is the Women’s Health “Eat This, Not That!” app, at $4.99. “As technology advances, devices proliferate and consumer adoption increases, we expect healthy growth in magazine app development, and in turn, in our database,” an MPA spokesperson told FOLIO. The MPA promises to update the list on a regular basis. Image by Magazine Publishers of America/Fair Use: Reporting.